A lot of old-timer modellers ask us to help find an old plan. Usually it's a plan for a model they built and flew themselves, back in the day. Or maybe a model they always wanted to build but never got around to... there are a few thousand plans up here on Outerzone, of course - but many plans are still missing. These are requests for plans we don't have, and we don't know how to find them, either. This 'Wanted' section is here so that you, the reader, can help us out. Outerzone Wanted section is a listing of plans wanted, by whom and why. If you can help locate a good quality scan of these plans (at say 300 dpi or ideally even more) then please contact us. Got a request you'd like to add here? Then see the bottom of this page for details. I am interested in plans of a P-51B Mustang drawn in 1979 by Mr David Vaughan and l believe published in RCM&E in the same year. It is a very good 1/6 scale Mustang. l am sure it will be appreciated by old time scale builders, also a quality design for Outerzone collection. Thank you! I was wondering if anyone can find the Guillows B-29 plan. I have seen the model on eBay but since the kit is discontinued it is three-hundred dollars used and I'd rather scratch build it. I have been searching for a set of the construction drawings, parts drawing and wing plan for the Fun Scale Cobra by Mark Smith. It was kitted by either Jemco or Dynaflite. After I learned to fly, it was my first sort of scale airplane, powered by a Super-Tiger .23 and had plenty of power. It had excellent flight characteristics and I had more than 300 flights on it before it was necessary to retire it. I have not been able to fly for a few years but I have built 2 Goldberg trainers to start with and would like to move up to another Cobra. Please help. I'm an Italian modeller. Do you have the plan of the model Taurus by Scorpio? It was a multipurpose airplane of 2 Mt wing span. Usually it was used like a towing machine. I was wondering if this model is still available if not in kit form, plans. I was wanting to build it with my grandson. Cheers for any help you can offer. I am trying to find a copy of the OK Pilot Delta Dart control line plan. It had a profile fuselage and trike landing gear. The wing had a triangle shape with a elevator running almost the full length of the trailing edge of the wing. It has an usually shape. Thank you. Hallo sir. I am searching for the plan of Svenson Mini Boy. Thank you. Wanted plan, Sure Flite 1/2a Dirty Birdy. Been looking for this for a while now. Thanks for the help. I have been in the hobby of model airplanes for 74 years. Now at age 84 I still continue to enjoy the hobby. I have flown everything from u-control to free flight to radio control, electric and gas. How can we forget rubber power. Most of my models are scratch built. At times I cannot determine if I enjoy building more than flying or flying more than building. I'm in good health and I contribute this to some degree to the flying field and work bench. I have never built or flown a twin power model and recently I have a want to do so. An RC Groups member told me of the "The M.E.N. Twin Trainer", an ideal balsa model for the first time twin powered builder and pilot. I know very little of this model other than it is a balsa kit, approximately 2 meter wing span, twin powered electric of gas. Would anyone there have access to the 1/4 Scale Piper Cub Kit made by OK Models Pilot? I have the kit but no plan. It's an old kit from the late '80s I think. The kit is intact. Would welcome some help on a lead to get this plan. I'm looking for a special plan since years: Wilfried Klinger - Mikado 2. I can't find it in your database but this plan exists - I have build this model some 40 years ago. Any suggestions how to get it? Where to look? I am looking for the plan from World Engines for their Hawk 460. I think it has a 52 inch wingspan and was made in the early 1970s. It is an interesting foam /Balsa hybrid. I think it was a very advanced fabrication for the time. Hi Outerzone, I would dearly like to obtain a copy of the Jemco FW190 D9, 50" wingspan plan. The model has long since gone out of production, and whilst the Mustang is quite common, the Focke Wulf 190 is almost impossible to buy. Hello. I'm looking for glider plan of Tom Martin (TMRC) SCHWEIZER 1-23 and 1-26 balsa or whatever only balsa (Schleicher ASW ? ). Thank you. I'm searching for a plan of the Mini Multi. It's a plane of Svenson, a little plane 1m. Thank you. I would also like to find copies of the Ace Simple Series Mustang, Corsair and PT-19. I built these in the early 1980s. Thank you for your effort in locating plans. I would REALLY, REALLY like to find a set of plans for Woody Woodward's 10 powered Cruisaire. Woody was one of the two people that taught me to fly RC. The other was Tony N. from the T & A Hobby Lobby in Burbank, CA. Tony taught me on a Royal Colt, and Woody taught me on his Cruisaire. Later he gave it to me. That was about 1979. Hello, I was recently given a Carl Goldberg Piper Cub kit in 1/4 scale with a 106” wingspan. I’m new to the hobby, so my knowledge base is pretty small. Unfortunately, though the kit was never assembled and seems to be complete, it is missing the full scale plans. The receipts that came with the kit (for ancillary items) are dated 1992 and 1993, so presumably the kit was manufactured and sold around or before that time. I’ve already emailed Great Planes/HobbyCo, who seem to have bought Carl Goldberg Models out sometime around 2007, and have searched the internet pretty thoroughly without finding a scrap of information about the kit, so presumably it’s fairly rare. I’d hate to let the kit go to waste, but I am certainly not skilled enough to try to build it without the plans. Attached is an image of the box, I can attach more images if it’s helpful. Thank you, PS Hello, Thank you for posting my wanted post. Unfortunately last night I realized that the kit was actually produced by Premier Balsa Products. Their logo on the box was mostly missing, and at some point someone had put the instructions for the Carl Goldberg smaller scale kit in the box. I’m still searching for the Premier Balsa Products plan though. Thank you. Hi - I would like to ask if you can place this request on the plans wanted list: it's the Veron Springbok slope glider from the 1970s. I would like to build that. I hope more people will send in classic British kit plans. All Veron plans and Keil Kraft and others should be on there :) Thanks and regards. "Just the model for that small diesel engine." 37 inch wingspan. This is the Albert Hatfull model that I am really keen on building if I can find the plan! I would REALLY, REALLY like to find a set of plans for Woody Woodward's 10 powered Cruisaire. Woody was one of the two people that taught me to fly RC. The other was Tony N. from the T & A Hobby Lobby in Burbank, CA. Tony taught me on a Royal Colt, and Woody taught me on his Cruisaire. Later he gave it to me. That was about 1979. Thank you for your effort in locating plans. Powerplanes International "Detroit Custom Cruiser"
I have a request for the plan of the Powerplanes International "Detroit Custom Cruiser" if anybody has one. I have just come across a photo in an ad and have fallen in love with it. A sorta 2 seat DH Beaver, and better looking. Kindest regards, and many thanks to the team for their efforts on behalf of us Aeromodellers. I'm looking for a blueprint of the model "Rubin". It's a flying wing from the year 1979. The constructor is called "Schlüter". Does anyone have a set of ACE RC Simple Series plans for the F4U, Mustang or PT-19? I would appreciate it if a set could be posted on Outerzone. Thank you for being here. Does anyone have a plan for the "new" super 60, that is the one with tricycle landing gear, that they would be able to share. Many thanks. I am looking for plan of the MOAR 43 by the great Arve Mozzarini and wondered if you could possibly help with information on where I might obtain one. I would dearly love to build and fly one (this is right at the top of my model aircraft bucket list). Hope you can help. Many thanks. I am hoping (against hope) that you will be able to assist me! I started building this kit years ago and having recently retired I now have the time to complete the project. I have the plans but cannot find the instruction manual anywhere. Is there any chance that you have this in your archives or advise where I might be able to obtain a copy? I have hunted high and low but to no avail. Any assistance will be greatly appreciated. Many thanks and regards. I'd like to ask you about a model that surprisingly has not appeared among your collection so far. The model is the "Piece O'Cake" from Dynaflite. I don't know much about it. I am not sure whether Craft Air was the former manufacturer, and then it was taken over by Dynaflite or the other wary around. Anyway it's a plan that I'd like to have so as to build it some day. There's another model from Dynaflite, the "Butterfly" I found about searching for the "Piece O'Cake". Though there are two "Butterfly's" in the list, I'm unsure whether any of them is the design from Dynaflite. I will appreciate anything you can tell me about them. I look forward to seeing the "Piece O'Cake" in your list soon. There are plans on Outerzone for the Robin Hood 10 by World Engines. I believe it was from the 1960s or 70s. There was also a Robin Hood 80 and 99 by World Engines. I am looking for the 80 plans. I thank you for the help. Probably it's not a best seller and may be not a good trainer but I like the appearance of Top-Flite Sierra .40 Trainer. The kit was discontinued for over 10 maybe 20 years, and according to the information I had received from the recent owner of the Top-Flite they also don't have a copy of the plan to sell. So may I request your kind assistance to find this plan from an old modeller? Thanks in advance. Ever hear of a Stinson Voyager by Art Lane? It was a kit from Canadian company J-5 Enterprises, 73.75 inch ws (1/4 scale). I recently bought this short kit on eBay and am in the middle of building it. I'm on the fuselage now. Would you have info or instructions or anything for this plane? Anything would be appreciated. I would love to find a set of plans for the Veron Super Robot Trainer. It's somewhat hard to find - I only managed to find an article of this model in an old RCM&E magazine. It's a very nice looking trainer which had the lines as a real airplane should look, not the usual box shape trainer that we know today. Is there a chance to get a good set of plans for this particular model? Hi, I'm searching the plans of Easy Sport 40, not the ARF model, but the plans of the first balsa kit .There's not balsa kit for sale and I want to make by myself this plane. Can you find this project? I am finishing the restoration of the Cavalier. It will soon be taken to our RC flying field for taxiing tests. The plane is a rare one. I would like to read what the plans said about the building and flying. There remains to be built for me the Humbrol Firefly glider. I would like to ask if you could add that to the wanted plans list. Surely there must be many plans out there - this could be bought in many places at the time, not only model shops but also toy shops (mid 1970s). I am keen to build it too! Thanks and regards. I am looking for a plan for a Jetco Thermic 50R/C. 46"-50" wingspan. Early 1960s R/C glider with a power pod. Regards. I am looking for an obscure tailless rubber model, from the late 1940s/50s, by "Elite Models," (U.K.) called "Phantom". If anyone knows ! ! ! I have been searching for the plans for a "Sport Air" made by Northeast Aerodynamics many years ago. They had a .40 and a .60 size. No luck so far. Is it possible you may know of someone who has it? I am looking for a set of Aircobra Plans for the Sterling kit. This is the Maxey Hester full sized version. I have hunted for this kit for a while as I like to build stuff that I couldn't afford when I was a kid. Found one and bought it, got it home only to find that it was complete, but no plans. Can't seem to find them anywhere on the web. This is a fairly common kit, thousands were sold, so someone must have a set off in the corner that I can either buy or copy. I know that they are probably huge. Would love the help. Peerless (U.K.) Predator plans needed. I have the kit instructions but no plan for this control line profile stunt/combat model. If you have one would you be kind enough to share a good scan of it please, I have a friend who wants to build one. Thank you. Dear Sir, I am looking for a plan for the "Great Planes Shoestring 60 ARF", since it is out of production now. I wonder if you can help me find one. Regards. The one I look for is from the 1970s - a Fighter 100 by O.K. Model (Pilot), Japan. It's a 3 channel radio high wing trainer for 10 0r 15 size engine. Hi all. I am originally from Worcester England but now reside in Victoria Australia. Your site is a real dream come true to us RC aircraft fans. I was wondering if there is anybody out there with the plans for an ugly stick biplane. I would love to build one of these but can't find the plans anywhere. If you could point me in the right direction I would be eternally grateful. If not I may convert an original ugly stick plan. Anyway thanks for a great site and keep up the good work. Does anyone out there have plans for the Goldberg Protege? Would like to build one. They seem like chicken's teeth, and since Great Planes bought them some years ago they have not made the plans available. I am looking for a plan for the Fleet Biplane produced by Concept Models. I believe they made this in a couple of different sizes. I am most interested in the quarter scale version if possible. Thanks for a great website. Love the new library website as well. Looking for the Graupner Satallit from circa 1959 48" free flight / single channel for 1.5cc plan 4602. This is from the 1959 catalogue from Graupner. Hi, I wonder if you can help me. I have been looking for ages for a plan or details about a Delta Wing Plane I built in the 60s. I cannot for the life of me remember whether I built it from a kit or just a plan ( I'm sure it was a kit ). It was a solid balsa construction Delta Wing Jet type of about 18'' wing span. It was launched using several strands of rubber which were anchored in the ground, & the plane was hooked onto the other end & pulled back some distance before releasing. It had an elevator which was held in an up position by an elastic band, but due to the speed of the launch flattened out to some extent then went to maximum as the plane reached the peak of it's launch, ( more strands or rubber for launching obviously gave more speed & height ! ) this then gave it a nice flat glide. Any help would be appreciated. I'm looking for the plans to a Veco Smoothie, a Bob Palmer model, that was produced back in the mid 1960s. The Veco kit was a modification to Bob's original design, from Air Trails. Some say the original with a bit thicker wing flew better, others just like the lines of the Veco kit. The model had an upright engine, but the Veco plans showed two versions for an inverted engine. I was in the Army back then, and several of us had an interest in CL flying. Our Chief Master Sergeant built a Veco Smoothie that he flew very well. When I got out of the Army, the first kit I purchased was the Veco Smoothie, probably for $7.95. Just a touch of nose weight and it flew like a dream with a Fox 35. I'm French and 40 years ago built the Svenson COXY, with a 0.49 Babe Bee. I would love to build another one, but no longer have the plan. Does anyone out there have it? Looking for the plan for Sterling "Hornet". Mid 60s design. Sport Bi-Plane, FF-CL. About 20" span. I built one of these around 1966. Thanks. I'm looking for a hand launch glider from the early sixties named "Sweet Sixteen" by Richard Miller. Richard is dead now and so there is no way to contact him. I built a bunch of these gliders about the time they were published and lost all of them to the great thermal god Hung. I'm guessing it was published in American Modeler because there is another Richard Miller plan on this site published in the magazine dated 1963. The Sweet Sixteen was probably earlier than that, maybe 61 or 62, because we moved in 63 and all my old magazines disappeared. I'd sure like to build some more if someone has the plans. Thanks. Hello Steve, I'm looking for the Flutterbug, a V tail free flight model kitted in the fifties by MODELCRAFT. Very hard to find but worth adding to any collection, hopefully with parts. Also looking for a Hobby Shack kit plan called Little Gasser, it was designed by Bob (?) McVicker, it has a 42 in wing span. Thank you for a great website. Hi, I am looking for a Guillow's Vanguard designed by Lou Andrews, it has a 36 inch wing span, 230 square inch wing area and uses a .049 to .074 motor. Steve, There is a vendor up on eBay selling copies of the plans for something like $24 US ($18 + s/h), but it still needs to be 'preserved' for everyone. I bought a kit back in the early '70s (probably had been sitting on the store shelf a long time already) and built it as best as my unskilled fingers could manage. Now that my skills are better but my fingers don't cooperate anymore, I'd like to try building it again. I think it had a 35in wing, and design-wise it is very similar to plan #193 (32in, Roger Hammer, 1940, Air Trails). Love the site, visit it every day. Building the Shereshaw 'Champion' right now, with the build log on RCGROUPS. Hi, I’m trying to find the plan for a Bowman Models 'Mini Stuntman' or 'Mini Stuntsman'. I can’t find any information on it anywhere on the net. It was a simple low wing sport plane, approx 45in span, foam wings, box fuselage, bubble canopy, for 20 size engines. Mid 1980s. This was my first low wing aileron model, I remember coming home from school on a Friday afternoon and opening the kit, then building pretty much non-stop and flying it on Sunday afternoon. Flew it for years, outlasted many engines, then I stacked it trying to show off to a very unimpressed girlfriend! I'm still searching a plan for the robbe charter 1 trainer. Perhaps some other user of the outerzone could help me with it ? As a fan of the 1/2a size planes, I am always looking for the fun little oddballs. Ace RC sold some kits early on (natch) and I'd love to find one of their early offerings called the "Butterfly". It was a 36" span V-tail racer design, and I think it was actually made by EKTronics (So probably a Ted Strader design) They also made the "Concord" and the "Freedom" 7 for small RC setups. This is another of those hard to find plans. This model was kitted way back in the fifties and it must be included in every Sterling plan collection, hopefully with parts. Hi Steve, I am trying to hunt down a copy of the Contest kits GOSLING 24” span free flight glider. if anyone can help, preferably with parts patterns. This is a wonderful website you have created, a real treasure chest! I have just reached retirement age and, I suspect like many of your contributors and members, am currently enjoying something of a nostalgia trip. I am only now returning to the hobby after something like 26 years "off" but prior to that I had been modelling since the age of about 8 years old and in the 60s was in on what I suppose were the fairly early days of R/C when my dad bought me a "Mini Reptone"... One of my heroes in those days was Frank van den Burgh, one of the members of the British team in the first World Aerobatics Campionships and a member of the Bromley Club. Frank test flew my first 'multi' model which was a way over ambitious (on my part) copy of a pylon racer called 'Coccyx' which Mr. VdB had designed....... It crashed! The Coccyx was incredibly fast and a bit of a beast and I doubt very much whether a plan exists for that but another model I would very much like to build would be the Sky Dancer, which is the model F vd B flew in the World Champs in I think 1962 or thereabouts. It had a tricycle u/c and an upright engine, which I think was cowled in. I have looked pretty extensively for a plan of the Sky Dancer but have so far been unsuccessful so if You or any of your contributors have a copy or know where I could get one, I would be eternally grateful. I’m looking for a plan for the Stardust Special Free Flight IC pylon model. It’s a popular 1/2A electric Texaco design so it must be pre 1942. I don’t know much more about it. I built this control line model when I was about twelve years old. I never flew it until I was a teenager. I had a Vivell 35 engine on it. In later years I owned a real PT-19. They are both long gone now. Today I am 76 and would dearly love to build another copy of my first CL model. I greatly enjoy your plan service and have downloaded a great many into my collection. I feel you are a friend for what you have shared. Thank You. Hello Steve. An old model maker friend is trying to locate plans for the Flitecraft Westland Lysander. He has part built the model over 20 years and the plans he has are now too faded to work from for him to complete his project. He is now 80 years old so if anyone can help in finding a clearer copy he will be able to finish his model. This plan has been very hard to find. The Colt/TriPacer by Royal/Marutaka was an excellent design and the kit was beautifully made with all parts saw cut, no laser. Being the same Tri-Pacer but with smaller engine of 108 horsepower and only two seats the Colt was an attempt by William Piper to compete with the Cessna 150. I remember that the plane was put on sale in 1961 with a basic price of USD$4.995.00. Incredible!! Those were the days. Dear Steve, Thanks for your altruist job. People like you help turn true our dreams. In 1982 my father bought me a beautiful german kit in Argentina which latter I came to mistakenly swap it for a bigger one. It was the HEGI FAN R/C, wingspan 1100mm, for .15-.21 RC engine. Thank you for your help. Hi, I am looking for a plan designed by Harold deBolt and released as a kit in 1968 by I believe when he was with Demco. The plan I am trying to get is the COBRA II. I have searched high and low with no success. It is possible that it was in his Live Wire series but am not sure. I would very much like to scratch build this model as I feel It was one of Hal’s best looking and flying designs. It has been redesigned for electric flight as the eCobra and is listed in the AMA database. However, I am looking for the original glow version. Any help would be deeply appreciated. Keil kraft Consort 67" span semi scale r/c for .61 motor. Looks like a Rawlinson Condor. Keil Kraft Jiffy team racer control line 1/2A 19" span for .5-1.5cc shown in 1959 KK handbook. Dear Sir, I have been asking many people if they know where I can obtain a copy of the kit plan: Skyleada 16" series Curtiss Owl, which was one of 12 models that were available during 1940's 1950's but I haven't had any luck in obtaining one as yet. I am looking for the plans of a Vacation Trainer. I was given this model and it's plan when I was teenager. I loved flying this 25 cu.in plane. A high wing, 4 channel trainer, it had great handling characteristics. It was acrobatic but forgiving. My dad and brothers "borrowed" it one day for a 'night flying' event, This was in the days before LEDs. They used glow sticks on the wing tips. Then they let some semi-inebriated hotshot fly/destroy my favorite plane. The dog was blamed. They went as far as making teeth marks in the balsa to frame the hound. It could have been a Great Planes kit. Not sure, and now I'm old so I cant remember anyway. I would be great if it could be found. This very attractive low wing model was designed using the Eaglet philosophy. Easy to build and lots of plywood. It has a rather thick airfoil section and despite being a low winger, it is very stable and easy to fly.. Also a very difficult plan to obtain. As a matter of fact, I want all versions of the Tiger. I may or may not be correct but I think there was a flat wing version of the Tiger which is the one I like most. Could I add to your 'want a plan' page, please. I have an AMCO kit for a 33" Waco S-6 complete but no plan. I am trying to find the plans for a 3/4 scale control line Curtiss P-40, that I think was designed by Paul Del Gatto, but possibly by Paul Palanek, The plans appeared first in Flying Models, sometime in the late 50s or early 60s. It was later kitted by Enterprise. It was advertised as a very accurate and detailed model. It was the only large scale model kitted by Enterprise. At the time, I saw ads for both the plans and kit, but never saw either in real life. The plans were sold by Timely Plans Service. A plea for the Ato22. This is a 22inch rubber model from the same Ato stable as Ato 36(glider) sold in Belfast shortly after the last war. I (last) built one in 1947. Debolt's Super Cub was a beautiful model. He also designed the Aeronca Champion using the same wing. I built a Super Cub so many years back that I don't remember. I would like to build one now with modern engines and RC. Not the Champion, This plan I have. I want the Super Cub. Total wanted plans = 123. The listing is ordered by EntryDate. Requested by Tony_Wright - 09/11/2018 - who said: "Hello, fantastic site, does anyone have a plan for the Mercury Wasp? A small CL model. Many thanks"
Requested by ChrisPinn - - who said: "I just loved reading the August 1951 issue of Aeromodeller as it was one I had never seen before [see RCLibrary]. I was very taken by the article 'Convert the Dorland to Diesel Power'. I tried to track down a plan of the Dorland in my files, but wasn't able to. It must have been published in 1946 as there is a b&w photo of it flying in the October 1946 Aeromodeller and the cover of the November 1946 issue has a colour painting of this attractive model. I can imagine that modellers of vintage models, such as myself, would be motivated to build this diesel conversion if the plan of the Dorland was available. Please keep a lookout for it!!" Requested by BernardPetroOdendaal - 22/03/2017 - who said: "I got hold of a Vintage Kit of the (Mercury Models) Texan - Class A Team Racer sometime ago. Upon opening the box yesterday I found the wood, hardware & tissue - but (alas) no plan. Is there any possibility of getting hold of this plan via Outerzone? Wingspan is 22 in, length 17 in. " Requested by MichaelAdams - 20/02/2017 - who said: "I was browsing through some old (1950) copies of the Aeromodeller and spotted a HALFAX (NOT Halifax!) ad for a very pretty pod & boom glider of 40" span called "Roma". Here in Australia where I now live, the Australian Electric Flight Association has introduced a new competition glider class for pre-1956 Vintage Gliders, converted to electric power. I am just completing a conversion of the 1950 APS "Archangel" and the Roma has taken my fancy for a follow up conversion. It is not an Outerzone listed plan, is it possible that somebody out there still has a copy they can contribute to the cause? Many thanks. " Requested by David - 13/02/2017 - who said: "What can you tell me about a plan of the GAL Hotspur said to be published in the Sept, 1942 *Aeromodeller*? My *Aeromodeller* collection is rather vast (for a Colonial anyway), but I don't have that one. Reason is, Flying Aces Club has a new scale glider event this year and I'm looking for a follow up design to my Piper TG-8, currently being cut upon. The Hotspur is quite lovely, compared to the TG-8, certainly. Hotspur camo/flash scheme is a real hoot. Yours in toil." Requested by Fabio Gil - 09/02/2017 - who said: "The Mercury Musketeer by Ron Prentice, 40" C/L (with parts sheet, 3.5-5cc, 2 sheets) would be a great addition. I flew C/L from 1977 till 79 when I switched to R/C. In 2002 I restarted it and still remember well when the local club founder sported one in a beautiful and colourful finish at the circle back in 1978. It was shocking when another club member kicked its rudder, accidentally breaking it down during a demo gathering event, full of newcomers waiting to watch its maiden flight at the Clube Piracicabano de Aeromodelismo-Brazil." Requested by Anthony Close - 10/01/2017 - who said: "Hi, I am looking for a plan of The Arrow by Bill Gibson from 1940, class B pylon model. Thank you." Requested by MikeBateman - 25/07/2016 - who said: "Please could you help me locate full size plans for the above aeroplane, which dates from the 1940s. This is a F/F rubber powered model, and was one of many "Wakefield's" which won many competitions. I still have my Grandfather's Flying Minutes, which is 70 years old this year, and is the worse for being stored in the loft. Aero Modeller Plans Service listed the Plans as APS 10/39 AD 1045, and the drawings were by Lees and Stott of Halifax. I hope you will be able to help me to source them, as you already list three Aircraft under the "Halifax" name, and I have already downloaded "Spartan", "Albatross", and "Teal". I have Grandfather's "Spartan", and have recently sourced the correct Engine and Ignition Pack. Looking forward to hearing from you soon. With many thanks and kind regards,"
Requested by RalphFisher - 25/07/2016 - who said: "Hi Folks, Many years ago, RCM&E published a free pull-out plan of an .049 pusher Concord. Just wondering if anyone would have a copy in their collection. Thanks in advance." Requested by PeterVDWaterbeemd - 29/04/2016 - who said: "The Eliminator by Barry Wheeler in Outerzone appears not be the original plan. There is an Aeromodeler Plans Service plan (possibly numbered PET310, published May 1953) which present the same model but is a little different. For example, the original had wooden bearings as opposed to the aluminium/plastic mount in the current Outerzone plan. Can this be sourced and added to Outerzone?" Requested by RaudelSanchez - 04/11/2016 - who said: "I'm a biplane fan and actually I'm finishing a SIG Hog Bipe I'm building from the kit plans. But the one I have always wanted to build since many years is the Greatplanes Super Skybolt but that set of plans have proved to be very evasive and therefore I've never managed to find it. Is it any chance that you could help me to find it? If you do, you'll make me a very happy modeler, cause I'm "in love" with that model." Requested by MikeWight - 04/04/2016 - who said: "If anybody has a copy of the Mini Eros plan by David Boddington, as published in in the Sept 83 issue of Radio Control Aircraft Extra, could they please add it to the Outerzone collection, I would very much like to build an example. At 42" span, converted to electric, it will make a perfect Park Fly model to show the foamies what a proper model is. Many thanks." Requested by Allan - 27/01/2016 - who said: "Hi Steve. Great site BTW. I'm after Hi-Liner, an 049 all sheet, model with Jedelsy wing and very high thrust line. I think it was an Aeromodeller plan and I have found ref in an old APS Handbook under X plan - #793. July 1961 I think. But no luck beyond that. I built one in a week and in the sixties when I was about 13. It went straight up and then down, and I want a second chance!" Requested by SteveWMD - 19/01/2016 - who said: "Would really like to have a decent fullsize plan of the KK Outlaw free flight model (not the KK Outlaw RC model, we have that one) it's the 50in wingspan model with cranked polyhedral wing shape. There's a pic here online at http://www.modelflying.co.uk/sites/3/images/memb..."
Requested by Gil - 19/11/2015 - who said: "Hello Steve! I keep this catalog since I was a teenager in 1982 and always wanted to build this model here from Revell-Hegi T-45. Can you please post this request on your site? Congratulations for your hard work. Thanks, Gil. " Requested by Adrian - 19/10/2015 - who said: "Hi Steve, My request is for the stick and tissue, stringered plan of the JETEX (twin Jetex 50) SARO SR. A/1 flying boat fighter, a British kit. I am not aware of any one selling the plan (?) and I have located the sheet parts on the rcgroups website forum. There's also part of the plan on the archived Jetex.org website. If someone could post this one on Outerzone, I would be most appreciative! Thanks"
Requested by MikeBohannan - 24/08/2015 - who said: "Steve, I absolutely love this website and check it every day - thank you for all the work you put into it. I have been looking for a copy of the Aristo-cat. It was published in MAN but I have not been able to find out just when - the good part is that it was kitted by Midwest, but again I have not been able to locate a kit or a set of plans. Hopefully this vast network can help. Thanks again for you work." Requested by RichardScott - 07/06/2015 - who said: "I have been searching for the plan and templates for the global or global quality P-39 aircobra. In the 90's I built one modified for electric speed 480 power. It flew so well that I built a variation as a Douglass TBD and another as a Bell Airbonita. All were good fliers. I would appreciate any help obtaining the P-39 plan. THANKS"
Requested by JohnS - 11/05/2015 - who said: "G'day Steve, I've been looking for years for the plans of Jimmy glider from pilot, OK models for years now and I wonder if some one could help me out please. It also has an extra sheet detailing cut out and building instructions. The plan is from the early 80's and a very successful model. I lent the plans to somebody but unfortunately I can't locate the person.I would dearly like to get a copy and build one again for old times sake. This is a great site and people should be greatfull for it. Thank you. Regards,"
Requested by ChrisPinn - 12/04/2015 - who said: "Hi Steve, Could you please put the Contest Kits XC4 on your wanted list. I built one in 1962 and it was extremely fast when catapulted with an ex-Wakefield rubber model motor. It had a rubber band controlled blow-back elevator which prevented the model from looping when catapulted. Very simple and very effective. It was advertised as being capable of 100mph and I believe it. The kit cost 6s 11d, which is about 35p in today's money! Thanks"
Requested by Roman - 23/02/2015 - who said: "Hi Steve, Found in a 1962 edition of Model Airplane News. Joseph Coles, FJ-3 Fury. It is a Scale, C/L and Dynajet powered. I have checked again and found this link : http://www.jitterbuzz.com/manreal/fury_model_02.jpg Very low resolution Image and I'm looking form something usable. Every now and again a plan turns up on Ebay but I have not had much luck winning an auction. Possibly someone you know has a copy that could be scanned. Thanks for your help. Kind Regards,"
Requested by davidp - 27/12/2014 - who said: "Hi Steve, Thanks ever so much for what you've done and continue to do. My hat's off. Looking for the RCM Wing Jig article and or plan. The Super Kaos article states it was in the August '67 issue of RCM. Thanks again!" Requested by DerickScott - 15/12/2014 - who said: "Hi Steve, Another request for your wanted section if I could. I am trying to locate a copy of the Veron SUPER ROBOT plans. This is the later updated version of the original Robot. If anyone has a scan or plans I could borrow to scan that would be great. Many thanks, keep up the good work Steve. Regards,"
Requested by sandman - 06/12/2014 - who said: "Hi Steve, Thanks for a great website. I've been searching for too long for plans for a 'Mistral Mercury' plane that my Father and I made when I was around 12 - 13 years old and still no success... It is was a Cessna type craft ie: wing over, rubber band powered balsa strut construction, tissue covered, wing span approx 24 - 30 inches. Its wings had a flat centre that fastened to the body with two rubber bands, same for the tailplane, and clear plastic for windows. It is almost like the '50 inch Endurance' 'Ajax' or 'Achillies' models but a bit sexier!" Requested by FabioH - 18/11/2014 - who said: "I would like if possible to include in the list of wanted the plans for 'Macchi 202' R/C scale model of RCM magazine." Requested by FabioG - 11/11/2014 - who said: "Hello Steve, Here is another request about a plan from the JUL/1978 Model Airplane News magazine issue called ESPRIT. It is a jet like model for .40 engine. If anyone can send it I would be very glad. Description: An exciting R/C pattern plane with the look of a military fighter and the qualities to win in any class. Design by Van Twelves employs typical balsa/foam construction. WS: 58 in. ; L: 43 in. ; Engine: .40; 4 to 5 channels; 1 sheet." Requested by JamesGreen - 28/08/2014 - who said: "Hi Steve, I am trying to find a plan for the Sagitta Glider, I remember as a boy my uncle building one and flying it from a farmers field on our camping trip. I have looked for it everywhere online and the more I see pictures of the design the more I want to build one. the plan/kit was produced by airtronics and was availible as the Sagitta 600 (2m span) and the Sagitta 900 (99in span). Thanks for putting together the best website on the internet. " Requested by DerickScott - 21/07/2014 - who said: "Hi Steve, I am trying to track down the 2 sheet plan for the Royal-Marutaka Boeing P26a Peashooter 67” span for .60-.80 motor. If anyone has one it would be very nice of them to share it. My copy unfortunately got damaged badly and is no longer useable. Best regards,"
Requested by Rocko - 28/05/2014 - who said: "Hello, I am looking for plans for the Pica Duellist 2/40 by Dave Platt. I have a kit however the plans not very good. I'm not sure if Pica made poor copies or if someone kept the originals and re-sold the kit with a poor copy. I would like to find a good clear copy before I try building on what I have. Wing span 67in, Wing Chord 14in. Thank you,"
Requested by TonyLeong - 09/05/2014 - who said: "Hi, I'm looking for the plans for QB20S kitted by Pilot. A shoulder wing 4 channel intermediate plane which I first learnt how to fly RC 30+ years ago. Light wing loading made it an excellent flyer and simple construction box construction made it easy to build. If anyone has this plan, I'd really appreciate getting my hands on a copy. I've managed to find plans for the other planes in Pilot's QB20 series of trainers (high wing, low wing) but not for the shoulder wing version. Many thanks in advance." Requested by JonBennison - 28/04/2014 - who said: "I have been using your plan service for a while and have been looking for a 1/4 midget .15 sized mustang plan. Unfortunately i havent been able to find one. I was wondering if you could help me find the 1300mm Miss RJ Mustang plan similar to this one (http://www.mh-aerotools.de/airfoils/images/missrj_1.gif) in a PDF at full size. The plan was designed by the Malina brothers and won the 1985 pylon champion ships it was printed in thw Czechoslovakian magazine around the same time. It was later traslated to german and was put into FMT but I cannot find it on there that was april 1987. I have used one of your small mustang plans and have converted it to a .09 size plane. It is brilliant i love it so much. Thank you for the service it is amazing i am only 18 but the first build i have done was from a plan of yours. The Graupner Race Rat is another one i have redesigned and built. Regards,"
Requested by TomVenters - 28/04/2014 - who said: "Hi, I am looking for a plan of Gi Gi, a biplane of about 30 inch span, a vintage of the 60s. designed for galloping ghost. Not to be confused with Gi Gi by john Baker. I think it was an APS plan but can't be sure. I built this in the 60s and installed 3 channel and it was the perfect weekend flier. A guy called Andrew Shering is demonstrating the model on You tube as he has installed electrics Cannot contact him. Would like the challenge of building and flying as 4 channel for old times sake. Log into Google and enter Gi Gi and it will find the Andrew Shering demo. Regards "
Requested by dfritzke - 04/04/2014 - who said: "I have been watching for a Sterling 'Real Sporty' on e-bay, but they always get away from me. If someone has plans for one, please post them or send me the plans and I will scan them and post them here for everyone. This is the larger RC version of the Cassutt Quarter Midget Racer." Requested by dfritzke - 04/04/2014 - who said: "I just discovered a nice little 1/2a RC plane from an advertisement in an old 1963 issue of Model Airplane News, called the Lil' Spirit by Consolidated. Looks a bit like a DeBolt design. If anyone has plans for that, send them to OZ or mail me the plans and I'll scan them and a file to Steve at OZ!" Requested by keithd - 23/02/2014 - who said: "Steve, I have used your plan library several times to build models I built many years ago in my youth. In the early 70’s I built a small rc aerobatic, low wing, for 20glow , the plan being by Phil Greeno (whilst he was in hospital) but can not recall the name... This model lasted until 2013 (40 years) with several engines and I would like to build another, any ideas! Hope you can help. Regards"
Requested by BobMcKeon - 09/02/2014 - who said: "Steve... Another plan if you can find this. It's part of the historical side of the early, early F.A.I. competition of the early part of the 1950's. There was a 72in wingspan model that won the first F.A.I. world championship event named "KOMET"... I only have bits of it from some correspondence a few years back. I think it was written up in a 1953 Aero Modeller mag. Someone should have this tucked away somewhere and be able to provide a hi-res copy.. Thanx." Requested by Modelbuilder2011 - 13/01/2014 - who said: "I am trying to find a plan for the Competition Models Company SST (1/2A rudder throttle canard. I have been looking for a year now. It was my second RC model. I would really like to build another." Requested by stormin - 31/12/2013 - who said: "Some time ago I started to CAD trace George French's Night train, but although the cad file was backed up, lost my scan in a computer crash. Could I find the photocopy? High and low to no avail. It was published in Model Airplane News some time in the late sixties. I wondered if one of your readers could oblige?" 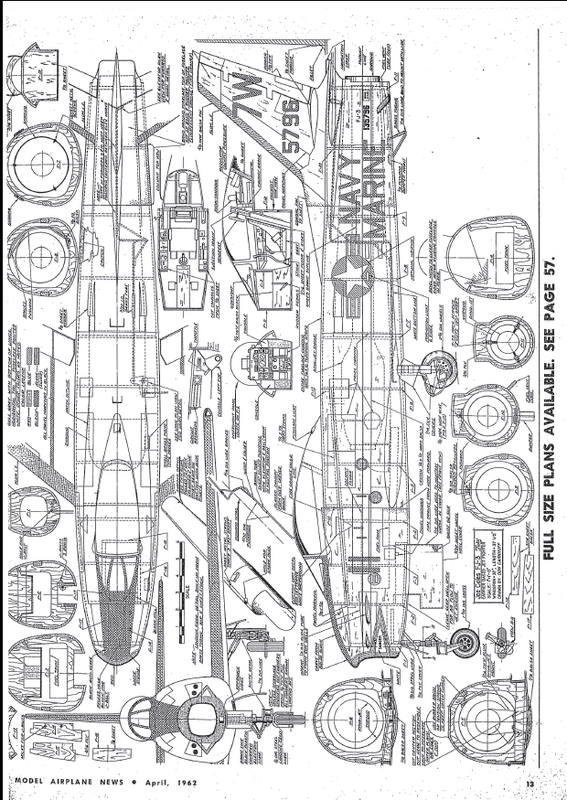 This plan found by Derick Scott - 04/01/2014 - notes: low res scan, usable. Requested by RB - 30/12/2013 - who said: "Hi Steve - I'm looking for a full size plan, Sterling Models, "Rudder Bird", Kit FS - 15, 52" wingspan, 35" length, .09 to .19 engines, 3 channel. An shoulder wing design of intermediate trainer model. Have kit but no plan. This kit plan are hard to find. I have searched for years without success. Does anyone have the 'Rudder Bird' plan? Thanks for your help." Requested by Edubarca - 14/12/2013 - who said: "This Cessna 180 is a very nice model by the famous German company. It was kitted in the late sixties. As with all models from Graupner, not easy to build but parts fitted very well and flew beautifully. Not easy to find but I'm sure someone out there worldwide has a nice copy and, hopefully, with parts." Requested by Minze - 20/11/2013 - who said: "Hi Steve, I'm looking for plans to the svenson wind puff. I came to know the model while looking for svenson Wayfarer plans and it just look like fun to build and fly. When searching it appeared a hard one to find. Thanks,"
This plan found by DerickScott - 12/09/2014 - notes: Complete, 4 sheets. Requested by Edubarca - 14/11/2013 - who said: "This is a smaller version of the FS1 58in wingspan kit of the Tri Pacer by Sterling. It is more modern and easier to make. It has been a very difficult plan to find and I hope it includes all the parts." Requested by OleBill - 06/11/2013 - who said: "Surely someone out there happens to have plans and printwood for the stick and tissue Comet Ryan Navion, and would be willing to share with others. (Not the Structo-Speed) version, the stick and tissue one. Thanks for your consideration." Requested by JimKatz - 27/10/2013 - who said: "Steve, Love your web site. I am looking for plans for the Berkeley 'Pay Dirt'. Thanks,"
Requested by MichaelS - 27/10/2013 - who said: "I am looking for the plan Puma 1, the old one from 1966 to 1970 from Robbe. Regards,"
Requested by Ratracer - 02/09/2013 - who said: "Hi Steve, Looking for the Zero-ette CL sport stunt model from Hobby Helpers plans group # 558, also appeared in the May 1958 issue of American Modeler. Thx"
This plan found by dfritzke - 21/09/2013 - notes: A bit low in resolution, but usable. Requested by BobMcKeon - 12/08/2013 - who said: "Am wondering if you've ever run across a plan from the late 50's by the name of 'Salt Lake City Sadie' Twin fin free flight for a .15 engine. ...That's all the memory I have of it. It appeared in one of the American mags back then. Enjoyed finding your Outerzone web pages...discovered this by accident, since I've been out of building for many years...brought back some fine memoriesThanx for your contribution to the hobby. Regards,"
Requested by BobG - 12/08/2013 - who said: "Steve, I'm after a design by Jim McCann published as a free plan in the March 1963 Aeromodeller. It was, I believe, called the McCann-ard 27. Thanks for you wonderful site. The work you put in is phenominal. I wish I had the skill to contribute, but I'm only just starting with CAD and the curve looks long and steep! " Requested by DannyM - 27/07/2013 - who said: "Hi Steve. The Mercury Magna F/F sport model. I purchased this kit from the holy grail of London aeromodellers, 308 Holloway Rd. Henry J. himself sold me the kit in 1966. It was an easy build but inexperience in trimming sealed it's fate. Now I have a bit more experience I would like to have another go at it for sentimental reasons. A plan would be very appreciated. Regards from the land of the kangaroo"
This plan found by BobPickernell - 09/09/2013 - notes: Hand-traced copy. Requested by Jeff - 26/07/2013 - who said: "Hi Steve, I have been looking for a plan for 'Heatwave' by Mick Green (I think). This was an FAI power model from C.1959 and may have been published in Aeromuddler. I built the model when I was a member of the Hornchurch club in company with the illustrious Ray 'Gadget' Gibbs whom I later came to assist during one or two attempts at the world speed record. I recall having great difficulty getting the motor to run on first flight so Ray stepped in and had it running almost instantly! He was rather disdainful of free flight models, particularly of the various appendages intended to increase performance. He was right of course, since my 'Heatwave' roared upwards in a tight spiral until OOS. And returned to earth more or less vertically to be smashed into a million pieces. I would like to try again. Best wishes,"
Requested by steveWMD - 18/07/2013 - who said: "This is a discontinued 1980s kit for an electric-powered pusher glider. Unavailable now, it was from GM Precision Products. Very pretty 80s styling, I think. There's a photo here: http://www.rcuniverse.com/forum/gallery_thread.asp?threadID=9082903 I really, really, want a copy of this plan. " Requested by Edubarca - 23/06/2013 - who said: "Lew McFarland SHARK CL stunt, this model was published in American Modeler in the 60s. It was also kitted by Jetco. I would like to have this plan. It is a winner with a very attractive design. Can also be converted to RC." Requested by DaveFritzke - 15/05/2013 - who said: "I am looking for a plan for the big 8' Sterling Schweizer 1-34, kit FS26. I bought a 'kit' and it has just a few parts and no plans. BUT I have the canopy and decals, the pylon parts and a few other odd bits, so I am encouraged to build one. I have plans in the AMA Kit Plan book, but they are greatly reduced and would be pretty fuzzy enlarged to full size. So I'm putting out a plea..."
Requested by GaryButton - 06/05/2013 - who said: "I am looking to find out if there is a Control Line plan of an Australian designed and built twin boomed twin finned constant cord winged model from (about) 1958 / 59 called 'Ringtail', it has an inverted engine. From memory it takes a 1.5 cc to 2.5 cc engine. My Father built one when I was about 8 years old. I never did get to see it fly. I do have a redrawn plan which is not the same layout, does look like the ringtail yet it is not an original plan or copy. I may be just going around in circles here; it would be nice to have a ringtail to join me." Requested by Danito69 - 28/04/2013 - who said: "Hi Steve, I`m looking for... OK-Model Pilot Focke Wulf 190. I will apreciate so much if somenone so kindly to find and upload these plans. Regards"
Requested by Derick Scott - 24/04/2013 - who said: "I am looking for the Keil Kraft Student r/c trainer 56" span for .35 motor." This plan found by DavidWilkinson - 03/06/2014 - notes: inc manual, 6 pages. Requested by JohnNurse - 15/01/2013 - who said: "I am looking fot the Twenty Minute glider plan. The original model was kitted by Premier just after World War 2. It had a 52.5" wingspan an elliptical fuselage formers and a spar less swept back wing with the ribs at 1" spacing. My late father built on for me and the performance was FANTASTIC. Obviously, free flight and we lost it 4 times. We had our name and address on it and it was returned on every occasion. My father paid the returner's 10 shillings on each occasion (50p). The kit price was 21 shillings. (£1.10p.) The original plan was a blue print. Perhaps you would be kind enough to use what ever methods you can use to secure it for me and other modellers. What I would do is to have it scaled up X 2 and build it for RC. It is and was a very beautiful model esthetically." Requested by Edubarca - 17/12/2012 - who said: "Although the most traditional and excellent Goldberg trainer was and still is the famous Falcon, he designed a rather simpler model called the Eaglet 50. It was done with lots of plywood parts for kit production because balsa in the USA has always been expensive. As with all Goldberg models, it was very attractive and flew beautifully. This plan has been, very, very hard to come by. By the way, Carl also enlarged the Eaglet 50 to 63 inches wingspan and a .40 glow engine which was very popular way back in the late seventies. " Requested by petersom7 - 13/12/2012 - who said: "I recall the effortless performance of a Graupner model which some unknown fella brought to our control-line field one day back in about 1958(?) and tore holes in the sky, using a motor which we all felt was really just not enough for the job. I believe it was an Ultra Stunter; there was another similar model / kit, I am not sure of the name but it could have been a Super Stunter, The Ultra was 44" span for a 1.5cc glo or diesel, not enough..? Not so. It hung right out there and flew better than our Frog 500 and Sabre 29 jobs. But the Ultra was obviously very light. I am not having much luck searching for these plans or even pictures. I am now hoping you may be willing to publish a request to readers etc to contribute to our store of knowledge and send you the goods to add both of these neato Graupner models to Outerzone's list..."
Requested by Anthony344 - 07/11/2012 - who said: "In my teenager years I have built one of Aerobatic Spitfire Stunter control line by Charles Mackey & now time has gone by I have lost the plans of this wonderful plane & I would love to build this control line Spitfire Stunter from Charles Mackey again , dream my teenager life again. The publisher is by American Modeler & the year is February 1960. the designer of the Spitfire Stunter is Charles Mackey." Requested by Gypsy940 - 05/11/2012 - who said: "I built a balsa/ply 3 pointer type hydroplane from a magazine drawing in an American magazine around 1960-63. It would have been in Flying Models, or Model Airplane News. It was called Snoopy, and powered by an OS 35. It went well, but I sold or swapped it to another modeller way back then. Have looked for years for that plan thru old mags,and perhaps thru your great site, someone could help me find it again." Requested by SteveWMD - 02/10/2012 - who said: "Does someone out there have the original plan for the KK Southerner? This has been hard to find." Requested by victorb - 28/09/2012 - who said: "I try to find the plan of the Lanzo airborne, an airplane designed by Chet Lanzo in 1938, for me and two friends. We plan to use these planes in meetings and contest of SAM (society of antique modelers) and sure for fun too. Original design has a wingspan of 108 inches, but any size will do the job." Requested by Edubarca - 19/09/2012 - who said: "This is a hard one: It is hardly a scale model but his designs were tops and flew great. More than 40 years looking for it!" Requested by SteveWMD - 11/09/2012 - who said: "This is the smaller 54in version of Henry Struck's 'New Ruler'. There are a couple of fine pics of this model at http://www.quietcow.com/american_ace.htm and I think it's very pretty. I'd love to buld it from the original plan." This plan found by JJ - 03/08/2013 - notes: complete with printwood. Requested by Edubarca - 11/09/2012 - who said: " 60" wingspan, not the rubber powered version, hopefully with all parts, at least the formers which are quite hard to develop from the plans." Requested by Edubarca - 11/09/2012 - who said: "58" wingspan, from their kit. Not the rubber powered version." Requested by rmcarter - 04/09/2012 - who said: "I would be very interested to see if anyone could find a plan for the Bi-Mini, a small biplane version of the KK Super 60, presented with the May 1987 Radio Modeller magazine (I believe)." Requested by Edubarca - 31/08/2012 - who said: "This model belongs to the RC series that Guillow put out on the late 70s and didn't catch on sales. Being a fan of the Cessna 170 (my father owned one that he flew directly from Wichita, Kansas, Cessna's headquarters, to Bogotá some 60 years ago through Central America) I would like to have it." This plan found by jpmorin - 29/06/2014 - notes: Complete, on 4 sheets. Requested by Edubarca - 31/08/2012 - who said: "From Sterling kit Radio Control (not rubber powered) version. These models are hard to find. It would be nice if the parts could be included scanned from kit if possible because Sterling never did include the parts of the model on their radio control kit plans. They only did this with the rubber powered series." This plan found by jmdauge - 29/03/2014 - notes: No printwood. Span is 72in not 68in. This wanted list is designed for requests for old, out-of-production, copyright-free plans. So. First, check that the plan you want is not for sale. Second, check again that the plan is not for sale. Really. Third, write us an email using the subject line: 'Wanted plan'. In the email tell us the name of the plan, the manufacturer (or the magazine) it came from, the date of the plan, also the wingspan. Then write me a few words about the plan with as much detail as possible of your memories, and of why you want this plan. Your request has a much better chance of making it onto the list if you have already submitted a plan or helped out here in some way. Also, if you write an interesting account of why you want the plan.